Forecast calling for rain on your wedding day? For light rain, grabbing some clear or white umbrellas and keeping an adventurous spirit means we can continue our outdoor photos as planned. However, if you’d rather not risk getting wet, or the sky is in a downpour, don’t worry — there’s actually a good variety of indoor photoshoot locations in NYC. Looking for an iconic rainy day wedding photo location? Grand Central is where it’s at. Not only is it instantly recognizable, but its vaulted ceilings, drop chandeliers, and charming old-school subway signs make it an elegant option for those who appreciate architecture. And yes, it’s going to always be busy. However, there are a few side areas that are not as trafficked as the main terminal near the clock tower. 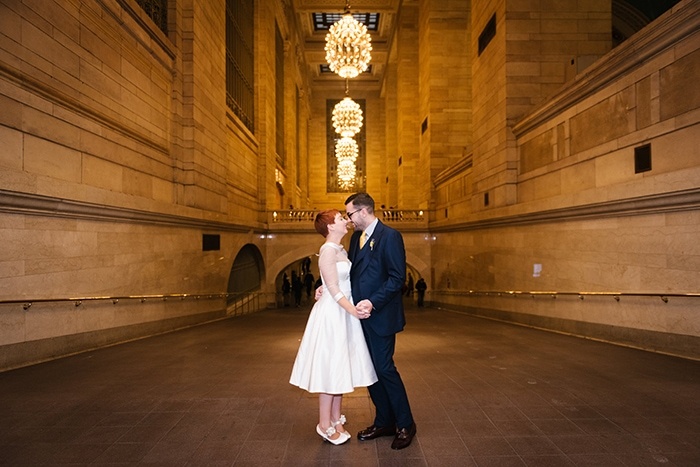 One additional thing to note: while you can take wedding photos in Grand Central (and you won’t need a permit if your photographer isn’t carrying extra gear), wedding ceremonies of any kind are not permitted. The most obvious inclination for choosing a photo spot is to base it on what’s aesthetically pleasing. However, planning a photo location around an activity takes the pressure off the moment; you won’t be posing for photos so much as enjoying a cocktail or a bite to eat. As a documentary wedding photographer, I love accompanying my couples to a bar or coffee shop after the ceremony to get some champagne or a latte. Not only is it a good time to refuel (especially if you decided to skip breakfast that morning! ), but the setting also lends itself to very natural, unstaged photos of you two in the moment. One of my personal favorites is Campbell Bar in Midtown — how can you beat those windows?! 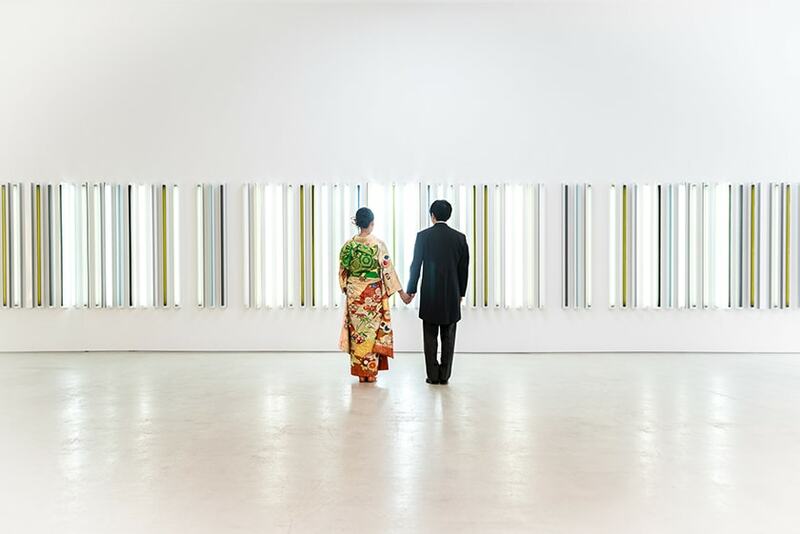 Not all museums are open to photography, but a few — such as the American Museum of Natural History or some of the galleries in Chelsea — will allow couples to come in and take photos amongst the artwork. This works out great for those who like a more modern aesthetic, or for those who can appreciate a giant dinosaur skeleton in the background. Pro tip: a few weeks before the wedding, check the gallery website to see what kind of exhibit will be showing on your big day. Knowing that art can be very subjective, the featured works may or may not suit everyone’s tastes. There are so many beautiful hotels in New York, it’s hard to imagine one that wouldn’t work in a pinch. 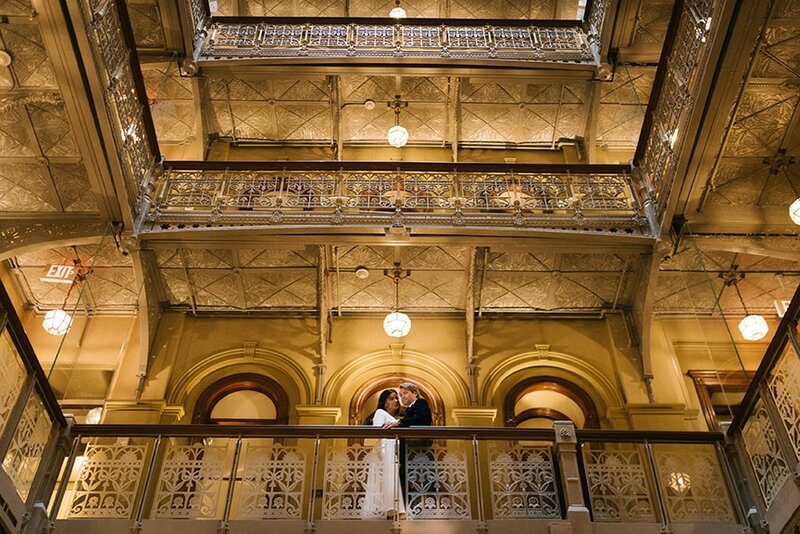 Oftentimes the rooms are also beautiful, so if you’re an out-of-towner getting married in New York, be sure to take a peek at what your hotel looks like — the atrium, bar area, or stairwell could all be a great rainy day photo location. 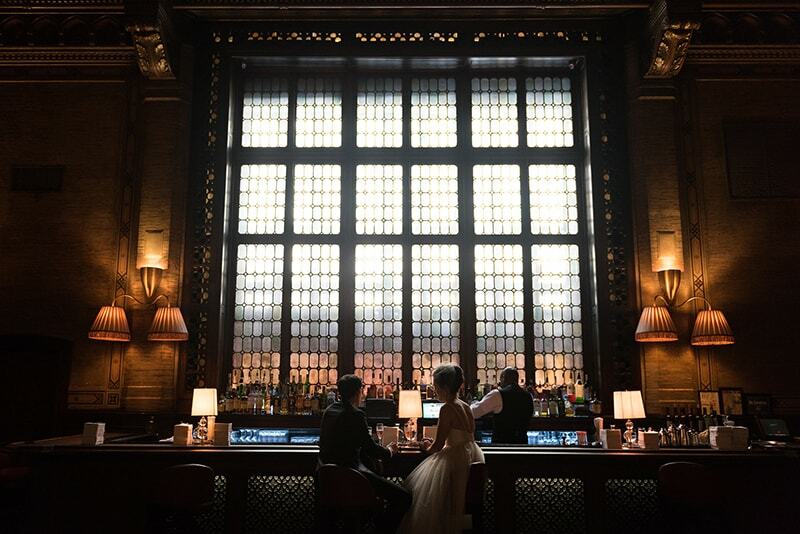 Some of my personal favorites include The Beekman and 1 Hotel Brooklyn Bridge, both of which offer stunning spots to shoot. Note, however, that some hotels, such as The Beekman, will only allow staying guests to shoot in certain areas. Your best bet would be to ask the concierge when you make a reservation. Can’t get indoors? As long as there’s an awning that provides some shelter, it might be a viable indoor photoshoot location. 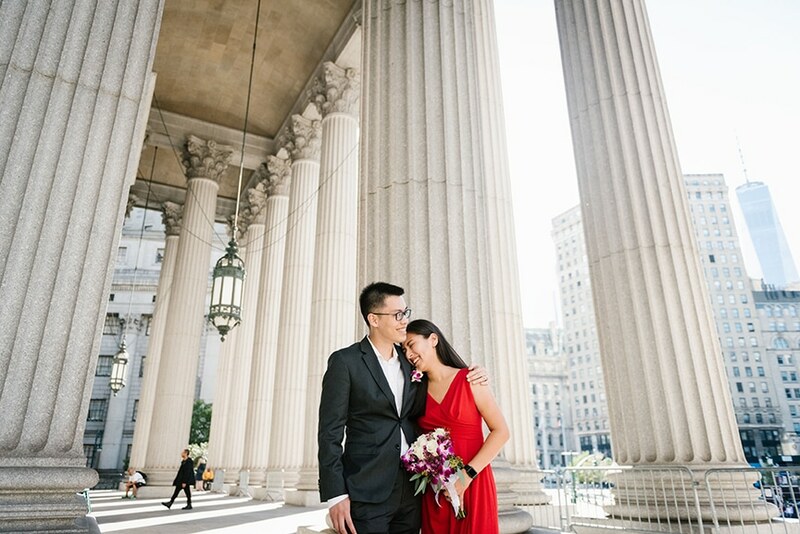 Some of my favorite sheltered spots include the front steps of the New York Public Library and the New York County Supreme Court, which both have soaring columns and grand steps to provide a beautiful architectural backdrop.